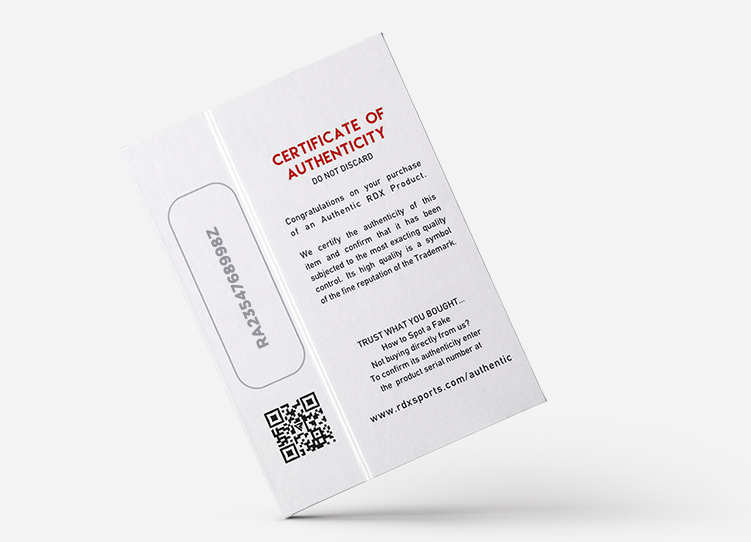 Choose authentic RDX products that are packaged in unique boxes, bearing RDX Corporate Identity and an authenticity seal. Enter the label ID and security code present on these genuine products to confirm the authenticity of your fitness item on RDX Sports Product Authenticity website (RDX Track Tag). WHY DO YOU NEED TO AUTHENTICATE VIA RDX Track Tag? > By making these meaningful choices, you are contributing to fitness and sports industry, combating counterfeit products that can cause severe injuries. Your genuine products will also provide you unmatched quality and a safe training experience, two signature features of our products. An added benefit is that with every authentication at RDX Track Tag, you get 10% FREE on your next purchase. © 2019 RDX Sports LLC. All rights reserved.